Our Voluntary PreKindergarten children gain skills to guide them and prepare them towards their future academic success. Each learning area of our programs includes kindergarten preparedness, social fitness, and mastery of gross motor skills. At VPK, each school day is balanced with opportunities for independent discovery, cooperative learning, and generous outdoor playtime for the daily built up energy pre-kindergartners have. 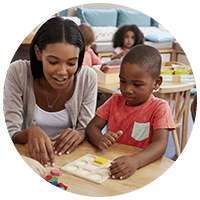 This educational type structure will provide instruction that young children need to better prepare for a school environment, like what tools they need and the importance of listening and paying attention. This program is a combination of a fun daycare and a structured school environment. 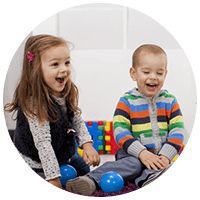 This program will give your child the chance to strengthen their social and emotional skills. 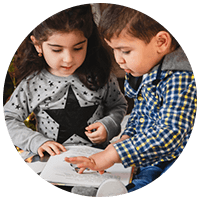 By engaging with other children who are in the same situation, they will experience empathy, build friendships, learn how to problem solve, and manage conflict. They will also see how a school works and they can become familiar with educational expectations. With a VPK program, your children will be reading and writing by the time they enter kindergarten. Click here for information on how to register your child for our VPK program. When you have your certificate, give us a call and we’ll reserve your spot! NOW ENROLLING FOR FALL VPK SESSIONS! This assesses the child’s ability to recognize letters or words, his/her knowledge of letter names (both upper and lower case) and the sounds they make. The print knowledge measure includes a total of 12 assessment items and two practice items. Recognize the remaining word when part of the stimulus word is taken away. The phonological awareness measure includes a total of 14 assessment items and two practice items. The mathematics measure assesses early numeracy skills across three different areas: counting skills, numerical relations skills, and arithmetic reasoning skills. The mathematics measure includes a total of 13 assessment items. 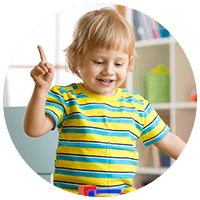 Assesses a child’s expressive language and receptive language. Assesses the child’s knowledge of adjectives, verbs, verb tenses, prepositions, and nouns. The oral language/vocabulary measure includes a total of 22 assessment items in assessment period 1 and 23 assessment items in assessment periods 2 and 3. These measures are aligned with the VPK Education Standards.